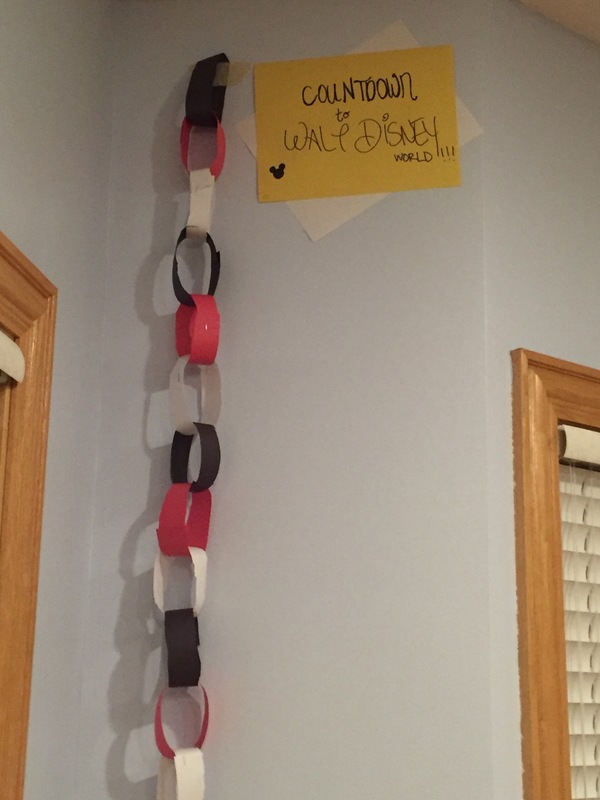 This will be my LAST post in the Walt Disney World Series… but do not fear! I have so many fun things in store for my very favorite time of year: AUTUMN! Back to school, holidays, apples, slow cookers, cardigans… OK, I’m getting a little carried away because all of those things sound fantastic. Also fantastic: DISNEY! Not so fantastic: waiting for Disney. Waiting is hard, but we find ways to make it more tolerable and more fun. And, occasionally, lucrative. Our “Money Chores” are special jobs Boone can do to earn Disney money. 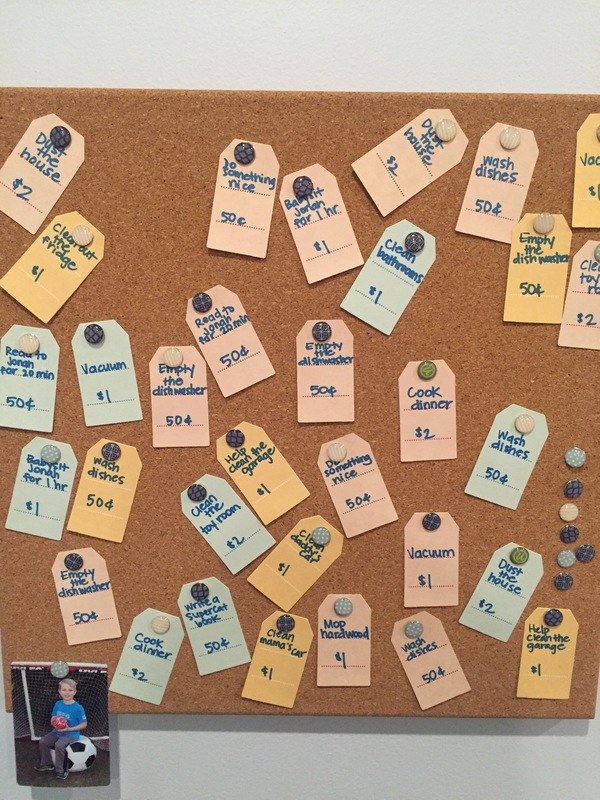 I have each chore and the amount of money it’s worth (ranging from 50 cents to $2) on a bulletin board in our living room. Boone is under absolutely no obligation to finish these chores — they are different from his normal, daily chores. He does, however, understand that if he chooses not to complete these, he will not get any extra spending money on the trip. To make it easy on mom and dad, who live in a world of “do you take credit cards? Excellent,” I have a small jar to collect the “finished chores.” Once the chore has been completed (and we check), we remove the card with the chore and amount, and place it in the jar. I’ll make a run to the bank a few days before our trip to withdraw the money that Boone earned. Hi friends, I have something I need to admit. And here’s my real problem with crafts: I like things my way. I like things perfect. I am an INFJ with perfectionism and I don’t like to delegate or complete tasks I’m not sure I’m awesome at. I knew I wanted to sit down with Boone and giggle and craft and talk about Disney World together, but I didn’t know if I would be able to separate my need for control from my yearning to let him do his thing. Surprisingly, I let him take the lead. I prepped crafts and offered beginning instruction, and then I said “go.” And we giggled. And we talked about the Haunted Mansion. And I cringed when he went crazy with a spray bottle or cut the most jagged looking “straight line” you ever did see, but I kept my mouth shut. And in the end, we have perfectly imperfect crafts and I learned a thing or two about my own desire for control and the importance of including your children and giving them freedom. At the advent of Pinterest, I thought I could change my craft-averse ways. I had so many boards of things I would create. I daydreamed spending long hours at Hobby Lobby and somehow turning broken chairs into coat hooks, or something. Oh, this never worked. I just don’t love crafting, and I don’t have much patience for it. So if you, like me, are craft-challenged (or you just want a couple crafts you can crank out in a very short amount of time), read on! In the past, we’ve made shirts with homemade iron-ons. 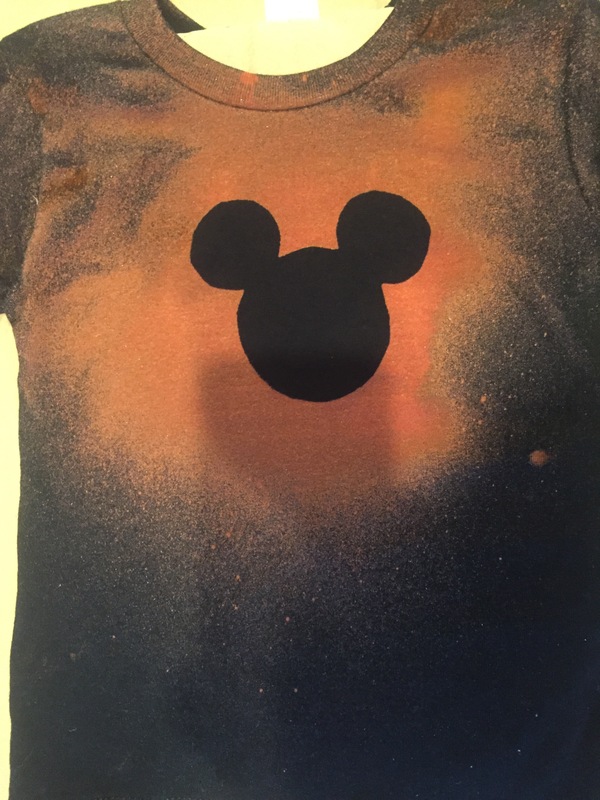 We’ve also done tie-dye. 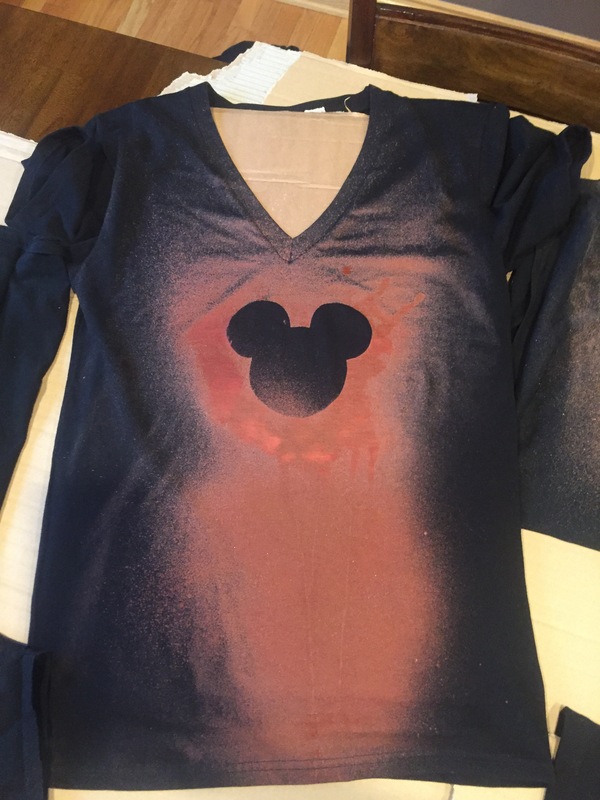 This year: bleach Mickeys! Boone sprayed all of our shirts, and I think he did the best with Jonah’s. What a little winner! Mine… is… made with love. Made with love. Don’t fix love, Jennie, you don’t fix love. I’ll be honest, this craft was inspired by the good old days of kindergarten. Cut construction paper into rings until you have enough for your countdown (as previously mentioned, we’re starting at 31). On previous trips, when we have done this craft, I would alternate black, red, and white paper rings (as we did again), but I’d embellish the rings in cute ways: black Mickey ears on the black rings, yellow “buttons” on the reds… and now I have two kids and summer just keeps happening, so we took Michael Scott’s advice and [KEPT] IT SIMPLE, STUPID. We’ll rip off a paper ring each day and get ridiculously excited as the chain gets shorter. Whatever kind of family vacation you plan for yourselves (and if it’s WDW, good for you! ), know this: family vacations aren’t always relaxing. They aren’t the drink in your hand/toes in the sand vacations that parents in television shows seem to regularly take (where are your kids, huh guys? ), but they can be FUN. You’ll be tired. You’ll be cranky sometimes. But, if you play your cards right, you’ll giggle and take pictures and not be responsible for making beds or cooking food for a week or so. I like your idea about the extra chores on the bulletin board. This is a good way to teacn a child that spending money is just a hand out from Mom and Dad. Also, Boone will be alittle more selective in how he spends his money. I meant to say spending money is NOT just a hand out.